Who is Trying to Silence Filmmaker and Judicial Watchdog Bill Windsor, Currently Held in County Jail? I recently was privileged to have a conversation with one of the top American legal minds of our day and age, Dr. Richard I. Fine, who lost his career and was unjustly put in prison for 18 months as a political prisoner. He was never even charged with a crime. His story is not widely known, and it gives the public an insider perspective to the depth of the corruption in the American judiciary. Health Impact News investigative reporter John P. Thomas recently interviewed Dr. Fine, and his report is below. Dr. Fine’s message is a message every American needs to know. There have been many articles published on the websites of Health Impact News and Medical Kidnap which mention judicial corruption. In this article, we take an in-depth look at one man’s attempt to expose judicial corruption, and the destruction of his legal career that followed. It destroys the myth that judges are always people of integrity who seek a fair outcome for those who appear in their courtrooms. To be fair, there are still some genuinely honest people who work in the courts. However, the presence of good people is being overshadowed by those who routinely misuse the authority that has been given to them for personal gain. 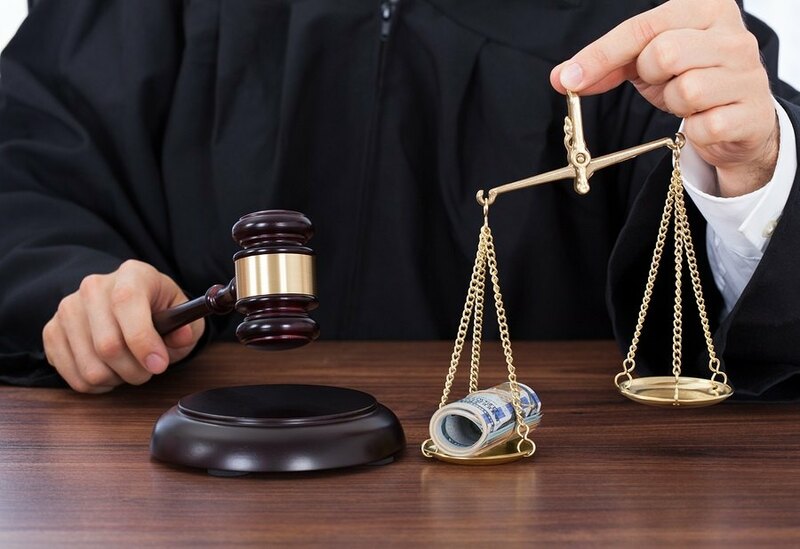 Corrupt judges do not identify conflicts of interest and do not step aside from cases where their personal connections might cause them to give an unfair judgement. Corrupt judges provide advantages to those who have given them money and power, while they disregard the rights of those who seek justice for acts of wrongdoing perpetrated against them. A ten year battle with judicial corruption cost Dr. Richard I. Fine his freedom and his license to practice law. He was not punished because he did wrong, but he was attacked because he did the right thing. The right thing was to expose the paying of illegal money to Los Angeles County judges and other California Superior Court judges after he learned about the practice in 1999. The right thing was to use his extensive legal training and experience to confront the pattern of corruption in the California judiciary and to do battle with the system that was corrupting judicial integrity. As will be explained by Dr. Fine, these payments can be called bribe money, because the decisions made by these judges followed a very predictable pattern, which benefited Los Angeles County. In cases involving the county of Los Angeles, the county almost always won the cases brought before these judges. This pattern of decision making is evidence that the payments to judges were functioning as bribes. I had the pleasure of speaking with Dr. Fine at the end of 2015. He was the first attorney to challenge the system of judicial corruption in California and the first to expose it to public view. He told me how the judges conspired to attack him and bring him down once he started to reveal the corruption. Los Angeles judges denied him the payment of fees for work he had done. They imprisoned him for 18 months. They took his law license. Even after it was proven that corruption did in fact exist, and he did nothing wrong by exposing it, the California Supreme Court still refused to restore his license. But before I get into more details about the betrayal of trust that Dr. Fine experienced, I want to introduce you to this remarkable man. I spoke with Dr. Richard I. Fine, Ph.D.; JD, on December 29, 2015. The information in this article came from this conversation and from his presentations and interviews that have been archived on the internet. Dr. Fine is a recognized leader in exposing governmental and judicial corruption. He is working hard to create a more just global society by providing expertise on issues relating to abuses of power, governance, international and comparative law, human rights and litigation oversight. Professionally, he is now working as a Strategic Consultant, and a Certified Mediator. He is the Chairman and Founder of the Campaign for Judicial Integrity, a grassroots movement dedicated to ending judicial corruption, reforming the judicial system and restoring our constitutional rights to due process and a fair trial. He also is the Co-Chairperson of the Judicial Reform Committee of DivorceCorp. The educational background of Dr. Richard I. Fine is extensive. He earned a Ph.D. in Law with a specialty in International Law from the London School of Economics and Political Science (1967). He earned a Doctor of Law (JD) degree from the University of Chicago Law School (1964). After completing his Ph.D. he obtained a Certificate of Public International Law and a Certificate of Private International Law from the Hague Academy of International Law, a Certificate of Comparative Law from the International University of Comparative Science in Luxembourg, and obtained a Higher Diploma of Comparative Law from the International Faculty for the Teaching of Comparative Law, Strasbourg, France. Dr. Fine pursued a wide range of studies in college. His major was psychology. He had a heavy emphasis in pre-med courses and actually took more courses in economics than in his major. He also accumulated credits toward a master’s degree in labor. The combination of his education and professional training gave him an unusually broad view of how the legal system, the political system, and the personal ambition and self-interest of leaders come together to shape the systems that manage life in our society. Dr. Fine was a member of the state bar association in at least one state from 1964 through 2011. Early in his career, he worked in the U.S. Department of Justice, Anti-Trust Division. He was the founder and chief of the first municipal anti-trust division in the United States for the Los Angeles City attorney’s office. In 1974 he founded the law offices of Richard I. Fine and associates. A few highlights of his career include: the indicting and prosecuting of General Motors and Ford for price fixing, the Investigation of the Pulp Paper and Newsprint International Cartel for international price fixing, and the representation of the Department of Justice in its first appearance before the Tariff Commission, which later became the International Trade Commission. He litigated the case of IAM versus OPEC, which was the case against OPEC nations for manipulating U.S. gas prices. He changed the way United Way functions by requiring it to allow donors to designate the charities where their donations would go. He forced local governments in California to return a billion dollars of illegally used funds to California taxpayers. He closed down the California State Government and required it to have authorization before paying anyone including the Governor, state legislators, and judges. The action he took against the State of California in 1998 regarding its spending practices ended 26 years of political budget crises. Dr. Fine received various certificates of special recognition such as the California State Assembly Certificate of recognition, and was honored as the lawyer of the decade and champion of court reform. From the abbreviated list of accomplishments and honors mentioned above, it is clear that Dr. Fine was, and continues to be, an outstanding advocate for justice in America. In 1999 Dr. Fine sued the county of Los Angeles three times. The first suit challenged the county’s diversion of 250 million dollars of transportation monies to solve a problem in its hospital system. The second case involved the diversion of 45 million dollars of fees paid to the county. The fees were designated for environmental purposes, but were being diverted to the county’s general fund. The third case involved 14 million dollars of child support payments that were being illegally held by the district attorney and which were not being paid to women and children. Dr. Fine won these cases, and the county suddenly had a 314 million dollar budget hole to fill, because they couldn’t use these funds as they had planned. Dr. Fine’s life unexpectedly began to change on September 15, 2000, when he read a quotation in the Metropolitan News from Ronald M. George, the Chief Justice of the California Supreme Court. Justice George had spoken to judges attending the annual Meeting of the California Judges Association. Dr. Fine explained that Justice George told the judges that he thought the payments to judges were wrong and maybe unconstitutional. It was through this newspaper article that Dr. Fine found out about the existence of payments made to judges by the counties, and began to consider the implications. Dr. Fine’s law license has not been restored and I guess we will know when judicial reform has made progress, when myself, Dr. Fine, Ken Ditkowsky, Lanre Amu, Andy Ostrowski and the other lawyers on my “wrongfully disciplined lawyers” list have had their licenses reinstated. We have all taken our oaths as lawyers seriously and fought against corruption, now where are the rest?